An MQ-9 Reaper takes off on a mission in Afghanistan in 2007. 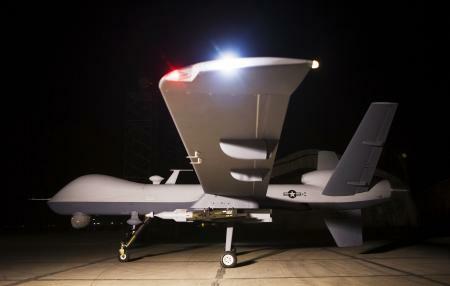 The Reaper conducted its first precision combat strike sortie against enemy combatants in Deh Rawod. The targets were struck with a hellfire missile after they were confirmed to be enemy combatants. AIR FORCE PHOTO. In the Taliban’s version of a “Year in Jihad” propaganda email to the media, they claimed to have shot down 16 remotely piloted aircraft in 2012. Citing operational security concerns, a NATO spokesman declined to say whether the Taliban had downed that many unmanned aircraft. However, the Taliban “routinely and grossly exaggerate their claims of success,” said Lt. Col. Les Carroll. But the Taliban did have legitimate successes in 2012, such as a Sept. 14 attack on Camp Bastion that killed two Marines, wounded nine other coalition personnel and destroyed six U.S. AV-8B Harrier jets. “We can unmistakably state that 2012 in Afghanistan for the current occupation was exactly as 1986 was for the former occupation during which they completely lost their will to fight and practically began the process of withdrawal and retreat,” according to the email from Taliban spokesman Zabihullah Mujahid. While Taliban claims of success are exaggerated, there is also a “nugget of truth” to their propaganda, said Bill Roggio, managing editor of “The Long War Journal,” a blog about terrorism. NATO trainers are expected to help mentor and train the Afghan air force until 2017; however, during a recent conference call with reporters, a White House aide said it is possible that all troops will leave Afghanistan in 2014. “That would be an option that we would consider, because the President does not view these negotiations as having a goal of keeping U.S. troops in Afghanistan,” said Ben Rhodes, deputy national security advisor for strategic communications. That’s the nice thing about a drones. When it dies you don’t have to write a letter home to the wife, kids or parents. You just fill out a new purchase order. Sounds like a pretty crazxy plan dude.